According to Disney's Eyes and Ears—the internal newsletter for Disney cast members—more than 800,000 guests participated in MyMagic+ testing in 2013. More than 600,000 MagicBand units have been customized (the most popular color being pink), and some 17 million transactions using more than 6,000 new payment devices have been processed. On one of the busiest days of the holiday season I went to Disney's Animal Kingdom, arriving just before 11:00 am. We found that Kilimanjaro Safaris had a 20 minute wait on the My Disney Experience app. 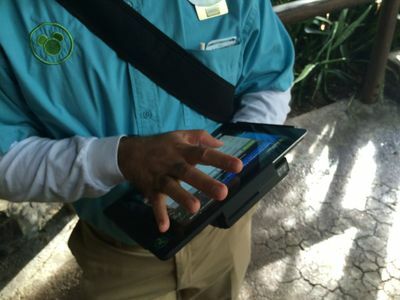 When we arrived, we saw cast members with tablets at the old Fastpass station for Kilimanjaro Safaris. Getting our reservations by cast members with special costumes featuring the MyMagic logo. Photo by J. Jeff Kober. I asked for reservations for Kilimanjaro Safaris, Festival of the Lion King, and Dinosaur. All were granted to me, with the first one within the hour, and each of the following about an hour apart. We went to Festival of the Lion King first, and you could have filled the entire lion section of the theater with those who had come in on Fastpass+. Given six to seven shows in a day, that's a lot of people who hadn't previously used Fastpass to get into the show. It's also a lot of people not using a Fastpass elsewhere. A large number of guests line up at the old Festival of the Lion King show to enter with their Fastpass+ reservation. Photo by J. Jeff Kober. Next we headed to Dinosaur, which had a 20 minute stand-by wait around noon. That's not bad for a very busy day, but it was still great having a Fastpass+ reservation. Afterwards, we meandered over to Expedition Everest, which also had a 20 minute wait. That's a great stand-by time on a holiday for the most popular attraction in the park. To test the system I asked if I could switch my Kilimanjaro Safari with an Expedition Everest reservation, wondering if you could still get a reservation by mid-day on a very busy day. I not only got a reservation, but it was for 1:30 pm—a little more than an hour later. In short, the whole experience was not only easy, but very flexible. I decided to test out this system on the first day of utilizing Fastpass+ systems with all of the guests coming to the Magic Kingdom—not just those staying at the resort. However this time, I wanted to see what would happen coming at the end of the day. I arrived a little after 5:00 pm on a day when the park closed at 8:00 pm. If I had arrived a few minutes before, I would have received three reservations. If the park is open for less than three more hours, you receive only two reservations; Under two hours before the park closes and you only get one reservation. There was no wait getting help, but more important was that every attraction had Fastpass+ times available. I chose Big Thunder Mountain Railroad and the Tomorrowland Speedway. The Speedway time I received was immediate; I simply walked over to the Speedway and within five minutes of entering the attraction I was seated in a car. 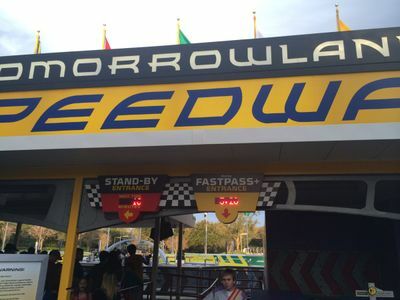 It's been a couple of years since I tried the Tomorrowland Speedway because it's never been worth the wait, but it was easy with Fastpass+. Photo by J. Jeff Kober. I later tried changing the Thunder Mountain reservation to a Jungle Cruise reservation, and then came back a half hour later and tried to change it back to a Thunder Mountain reservation. Both were easily made with only ninety minutes left in the day. When I asked about a Wishes reservation, I was told it had been available earlier, but by ninety minutes prior to closing all availability had been taken. It really helps if you have a smart phone, or if you bring along a tablet. Before coming to the park, download the My Disney Experience app and register your name and others who might be attending. Take time to consider which attractions and events you want to book using Fastpass+. With your smart phone you'll be able to look at similar days prior to your trip and see which queues tend to be longer than others. You'll also notice that some Fastpass+ queues will probably never justify acquiring a Fastpass+ option. 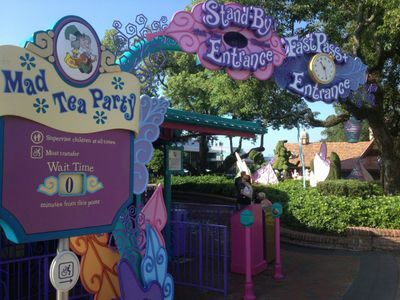 Mad Tea Party would probably be an example of a wasted Fastpass+. Not the best use of a Fastpass+. Photo by J. Jeff Kober. Decide in advance how much of the park you want to experience. If you're looking to do everything you can possibly do in a day—if you're planning to take on some two dozen or more attractions while you're in the park—you will probably want to come early in the day and hit as many rides and attractions before the park gets too busy. You would have had to do the same thing even under the old Fastpass program. If you're there to simply enjoy the day and you're looking to do the average number of attractions that most people do (around eight) then you'll probably be fine with going in later in the morning or early in the afternoon. You may buy your ticket wherever—online or at your hotel or at the entrance to the park, but if you don't buy it at the park, the voucher you receive will probably need to be exchanged for a credit card-like pass. Any of the ticket windows can do the exchange that as well as Guest Relations outside the park. If you're going to Magic Kingdom, know that you should do that at the Ticket and Transportation Center before getting on a monorail or ferry; the lines for Guest Relations outside the entrance to the Magic Kingdom can get very long and very slow. If you've downloaded the app, ask the cast member for assistance in syncing your ticket with the app so that you can see your reservations when you're on My Disney Experience. In addition there is usually someone with a tablet near the major attractions of the park. For example, if you are heading to Space Mountain first thing in the morning, you can get on while there's still not a long queue without Fastpass+. Don't stop at Town Square Theater first thing since that may already have a long line. Consider stopping at Stitch's Great Escape in Tomorrowland on the way to Space Mountain and take care of your reservations there. 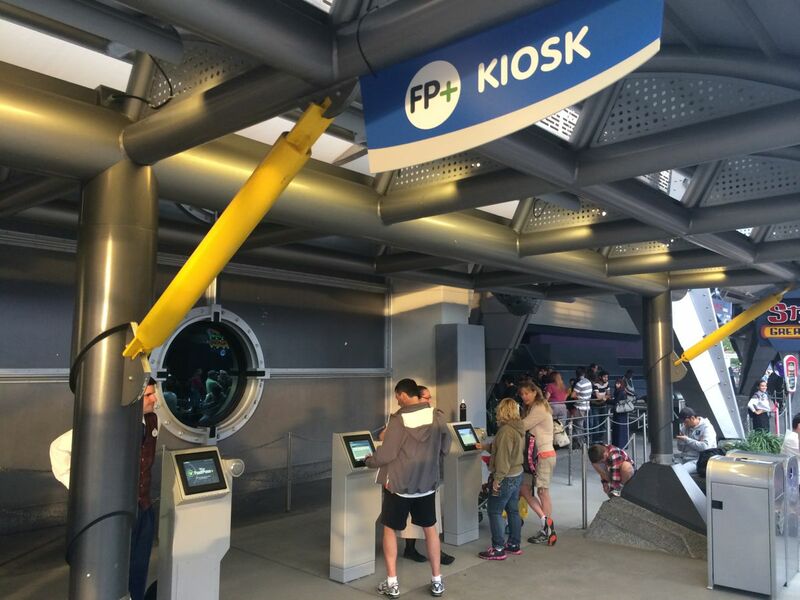 This Fastpass+ kiosk is located near Stitch's Great Escape in Tomorrowland. Photo by J. Jeff Kober. If there's a line at a kiosk, find someone with a tablet near Space Mountain and get your reservations there. 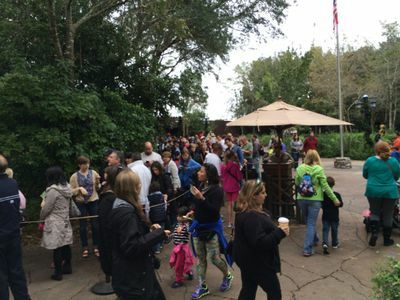 Remember—don't panic if you see a long line of people making Fastpass+ reservations. Just move on looking for someone with the right costume and a tablet. There are many places and many cast members to help you handle this transaction. You should not have to wait in a long line to get your reservations. These cast members with tablets are waiting to help guests in front of the old Fastpass machines that have been covered. Photo by J. Jeff Kober. The cast member will help you to make the reservations, walking you through the process. The good news is that, like the old Fastpass system, not everyone in your party needs to be there to get their reservations; one person can handle all of the Fastpass+ reservations for the family or group. Going back to our earlier example, if there was someone that didn't want to ride Space Mountain, he could handle the Fastpass+ reservations while everyone else heads off to the standby queue. If you decide you do want some family members to go on some things, and other family members to do other things, be sure to keep track of whose ticket you are using for each reservation. Usually when you obtain your ticket at the park they encourage you to put your name on it; be sure write down a name on each ticket to keep things in order. With the old FastPass system it didn't really matter. With the new system it makes much more of a difference—especially if you are all doing different attractions. 5. Take a picture. Snap a photo of the cast member's tablet screen with your reservations on it, especially if you don't have the My Disney Experience app loaded on your smart phone. It can also provide a backup later on if you can't access your records on the app. The Fastpass+ reservation will look like this on a tablet. Photo by J. Jeff Kober. Once you have a reservation, it's time to have fun. No more having someone run ahead to get a Fastpass (I spent a good part of my years as a dad doing this). Instead you can enjoy a more leisurely approach, heading to attractions at the reserved time. Before swiping your card and heading into the attraction, check the wait time. If the standby wait time is very short, go to a nearby cast member and make a new Fastpass+ reservation for something else. Be sure you get the most value from your Fastpass+ reservation and that it's really saving you time. The bad news with Fastpass+ is that you are only allowed three at one time. In the past, if you were a real go-getter, you might have been able to access several more in a given day's trip. Now you have only three options and you will have to use the standby queues for the rest. The good news is that there are a lot more options to choose from, so you want to consider where to best use your Fastpass+. An obvious thought for many is to use it on the three mountains: Space, Thunder and Splash. Assuming that the queues to all three were equal in length (which they often average out to be) then I would take Splash on a summer day first, since the other two have interactive queues that keep you entertained while in line. Still, there are other choices worth considering—especially since those three mountains have a fairly high hourly ride capacity. 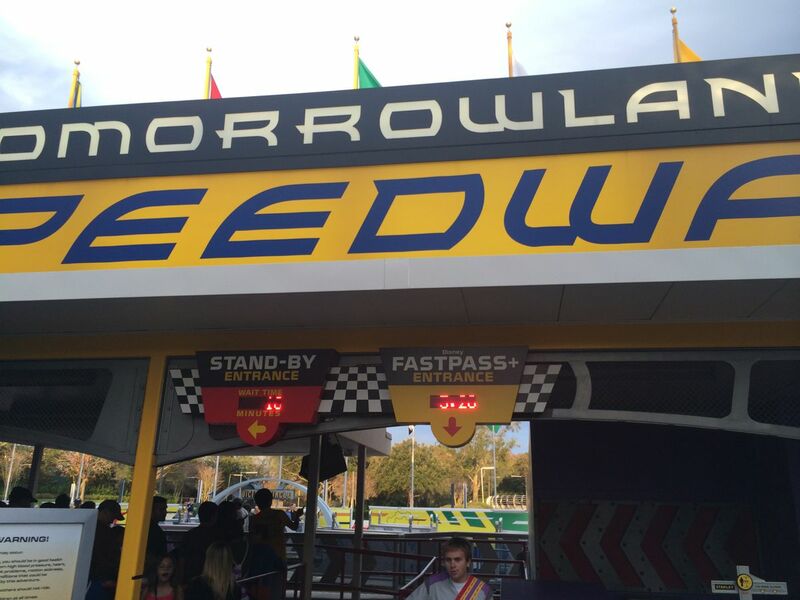 Tomorrowland Speedway is new on the Fastpass+ list and often has a very slow moving, "nothing to do but wait," line. If that's an attraction that's worth it to you, then go for it. In addition, most of the meet and greets have been added to the list. Some of those are very long waits and very slow moving—particularly Enchanted Tales with Belle. The final sets of choices are entertainment such as Wishes, which allows access to a reserved space in front of the castle. Although you can see the fireworks from many places throughout the Magic Kingdom, if having a space reserved in the front of the castle is important to you, you may want to take a FastPass+ option for that. Character greeting locations have been added to the expanded Fastpass+ list. Photo by J. Jeff Kober. Well... this is all being piloted, so we need to wait a little longer to pass a final verdict. Early indication is that this approach may be doing a better job of balancing out guest flow. However, despite speculation that there wouldn't be times available to the day guest, I found more availability for attractions on my visit using Fastpass+ than I had under the old Fastpass legacy system. We still haven't yet seen what will happen with Disney's Hollywood Studios and Epcot. Currently a tiered system seems to be in place, which may be disappointing. However, the thought that you may no longer have to haul it over to Soarin' before noon to get a Fastpass for a time that is hours later in the day may make this really quite appealing. As a non-resort guest have you tried Fastpass+? What has been your experience? Please share your insights. Also, keep an eye for our comments, as we'll keep you further posted as developments occur. Jeff, thanks for a calm, rational explanation of the process. Hopefully this will calm some of the outright fear and disdain of the new system that's been expressed over on Mousepad. This is a great article! I have seen a lot of negativity about FastPass+ on various Disney forums/boards but your experiance is closer to what I would expect. Your point of being able to change the FastPass+ reservation if you get to the attraction and the standby line is short is a great idea. Jeff, thanks very very much for the article! I'm a local who will be staying on property 1/24. I'm not a techie, but found that I could l use the FP+ system very well. I thank you for the little details, like taking a pic of your ressies in the park. I was wondering how I was going to remember everything? Good Tip! And I never even considered FP+ for shows until you mentioned Enchanted Tales. I always see a line there. I will make sure to get a FP+ for that one before my trip. 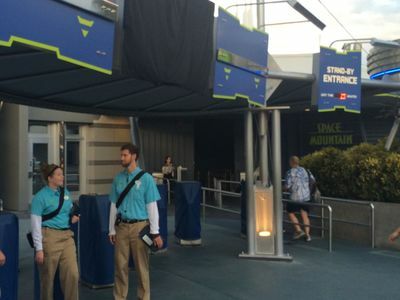 So was this article due to all the negative comments on trip reports lately about fastpass +? You make it sound easy even for those of us who refuse to drag a tablet or smart phone on vacation. I do like the paperless route that Disney is going with this. My trip report (the week immediately after Thanksgiving) praises FP+, with a couple exceptions for show-type attractions that I later felt weren't worth having used FP+. Of course, we were staying on-site and made our FP+ reservations a couple months in advance. But even so, when my wife and I caught colds and had to skip the parks for a couple days, I was able to access My Disney Experience on my pad on our checkout morning and was able to get FP+ for that same morning for Soarin' and Mission: Space. Yes, I wasn't allowed to get FP+ for both Soarin' and Test Track, but still I was amazed to get Soarin' right at the last minute. During our trip, we weren't tied to the phones because of FP+. I had a slip of paper in my pocket with our FP+ times and only used the phone to occasionally check wait times for other standby lines, which was very convenient. I don't like the fact that you have some major advantages using a smart phone or tablet. Some of us don't have the budget for a smart phone and data plans. So while I am not totally locked out I am at a slight disadvantage. This article is much needed given all the the sky is falling analysis of FP+. Thank you. The information is invaluable. It is unfortunate that there are only 3 FastPass+ opportunities during a day in the park. I know that there are some who could do closer to a dozen during a long summer day. Still…if you could wind back the clock 15 years. Imagine that you had never heard of FastPass, and suddenly Disney announced a reservation system whereby you could go to the front of the line at three of your favorite attractions. We would have all been ecstatic. The truth is that the technology wasn't there 15 years ago to make that happen. In its wake a legacy FastPass system was put in place complete with paper tickets, but you had to go visit the attraction to get one before you came back to go on one. And you had to accept what time they gave you--there was no negotiation. And you might come back and find that you really didn't need one in the first place. Now the technology allows all of that to go away and for you to simply have a reservation for three either before you arrive, or just after you arrive. And…you get to change your mind any time during the day. That's FastPass+. I just returned from a 5 day trip, staying on site, and using Fastpass+. I love it. No running from fastpass machine to fastpass machine, hoping to get a time that works. 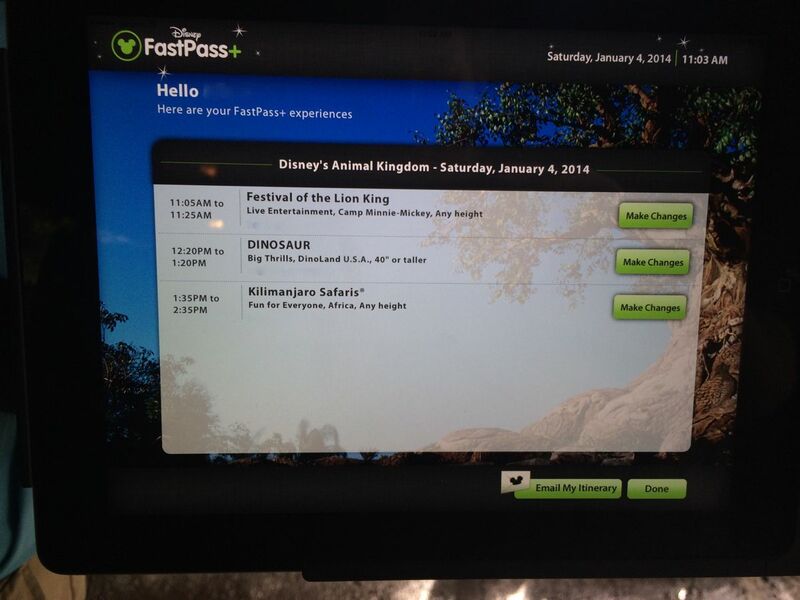 With fastpass+ I could coordinate all my fastpass times and change them on my phone or at the kiosk with ease. Only having 3 didn't bother me, especially since we had one for big thunder MT and the wait time was 5 min, so I didn't use the fastpass and changed it after I got off the ride. One day I had them all in the morning, and decided pool time would be more fun, I just went in and swapped them all within 5 minutes. It was awesome. I love the magic bands. never had to carry anything else. I assume staying off property will make this all a little less handy, but overall I was very happy with my experience. After having used the FP+ system in December, I was quite impressed with it. Being annual passholders and DVC members, we're at WDW at least twice a year, and we don't ever feel the need to get a dozen Fastpasses a day, so three works well for us. The "tiered" system isn't great, as you end up with two useless FP+ reservations at Epcot every day (who could ever possibly need a FP+ for Imagination? ); I'd prefer being able to make FP+ reservations for any three attractions each day. My main concern at this point is that Disney will try to "plus" the system for certain users. Whether it's additional FP+ for resort guests, or a premium "unlimited" FP+ for some large amount of money, I'm not in favor of that. Right now, resort guests do get the advantage of the 60-day advance reservation period, but it doesn't seem that people are having trouble getting same-day reservations, so that's not a huge deal. The beauty of the system is that it can grow and adapt over time. So far, the only real downside to the FP+ system is that we have to listen to so many people complain about it -- and the people complaining are almost universally those who have never used it. I noticed that some folks used this in December, and some in January. Were the crowds for WDW that same as always for the holidays, lighter than usual, heavier than usual? I know that Christmas and New Years were a little lighter here in Anaheim (but the 27th was a closure day). I just wonder how effective this would be on the busiest of days since noting that many of the folks posting here have said "My wait time was only X (5, 10, 15) minutes so I switched the reservation" - and it was on a major E ticket. I know that the FP changes so far here in Anaheim (monitored return times) as well as new Assistance program have helped curb some of the lines on normal days (busy or not) but on the most crowded we still had 120 and 150 minute waits on things like Radiator Springs Racers. For me, a 15 yr passholder who has seen many programs come and go, I will wait for a full year to see what the trends are in order to really know the full scope of operational aspects. Jeff, thanks for an informative article about the new system. It's a major change for Disney, and especially for those of us who know the old system well and knew how to use it to our full advantage. Your advice about never using FP+ if you arrive and the line is short is great - this was our biggest issue when we used the system during it's early test phase. We would arrive to an attraction with a short wait and feel like we were wasting the FP+, but never took the obvious step of replacing it with another attraction and just went through the FP+ line anyway to save a minute or two. The one thing I'll miss most from the old FP system is the idea of constant "area" fastpasses that most Disney veterans could make work on all but the busiest days where the simple rule was to have a FP in hand at all times (usually with a return time of less than an hour) and do multiple attractions with a very short wait in the same area while you were waiting. By doing that, it was very possible to do an entire day's worth of attractions and never have a wait of more than 10 minutes, even with moderate crowds. That obviously won't be possible with the new system limiting you to 3 FP's per day. All kidding aside, that's one of the things I love most about the FP system (both old and new) in general - everyone in the parks has an equal opportunity to use the system to their best advantage. I never feel any guilt about watching others stand in line while we just walked on rides because I knew they had access to the same opportunities we did. The day Disney switches to a pay for FP system, or grants that opportunity to some but not others, is the day the system loses my support. They haven't gotten there yet - although I am a bit concerned that allowing WDW resort guests to book FP's ahead of time is a step in that direction. The day Disney switches to a pay for FP system, or grants some an advantage over others, is the day the system loses my support. would you say that someone staying on property, who may get access to a reservation when the dayguest (or off-property guest) is "done for the day" does not (say a bonus one or two reservations, etc). falls into your category? I can see that being a no-brainer on the part of the parks. or if you booked certain packages at a certain time of year. since its all connected now electronically into one system, with modifications, its possible. If there's a concern that I hear throughout this thread is whether Disney will give more passes to others who are staying on property or who pay more. I can't judge that because it hasn't happened and Disney hasn't said it would. That doesn't mean it might not happen. 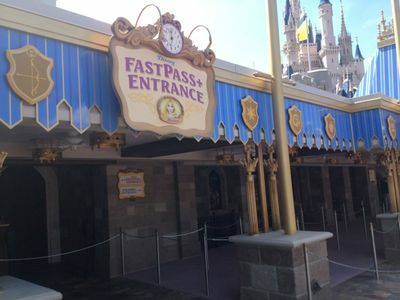 But I think with all of the money Disney spent over the years separating many of the FastPass queues from the stand by queues so that it didn't appear unfair, I would think that Disney would make every attempt not to be unfair in the future. Moreover, there are already enough challenges trying to give everyone three choices (hence the current tiered approach at two of the parks) that I don't think they want to put any added pressure on the system by giving some people more choices. By the way, Disney resort guests never did get additional FastPass privilege in the last 15 years than did the non-resort guests. Everyone had to wait until the stated return time or two hours to get another one. They had the technology to do otherwise. But they didn't. I don't know why they would want to do so now. Again…something different might happen…but so far over the last 15 years it hasn't. So I wouldn't unduly preoccupy my attention on whether it might happen. If you love some of the most popular favorites of the park, this will be harder to make choices in that first tier. Of all of the first tier, I would definitely choose Soarin'. What about you? I've been on Soarin' so many times since DCA opened I would have to go with Test Track since its not at DLR. Agree, as I'm of the same experience with Soarin' at DCA. Although I'm not currently planning a trip to WDW right now, it is always on my horizon! I am keenly following the progress of FP+ since I fall into the non-resort guest category; it is much cheaper for me to stay off-site as my trips are usually at least two weeks long plus our ticket media has been military in the past as well. I've made dining reservations online and used the "My Disney Experience" app last spring, mostly for wait times when in the park, so I am very interested to see how FP+ will affect my next trip!